Dozens of people from across the globe have tweeted out images purporting to show unidentified flying objects in the skies over MacDill. The tweets began Sept. 1 when a self-described UFO expert named Michael Salla sent out pictures of what he claims are extraterrestrial conveyances. SOCom officials could not be reached for comment. But Terry Montrose, a spokesman for the 6th Air Mobility Wing, MacDill's host command, laughed when I asked him about Salla's claims. "No, there are no secret UFOs or a secret Air Force Space Wing at MacDill," Montrose said. "There are no flying triangles." So take Salla's claims with a grain of salt, and consider some of the other material you'll find at his website: The suggestion that Hurricane Irma may have been directed by space weapons, and books for sale that include a Salla title, The U.S. Navy's Secret Space Program and Nordic Extraterrestrial Alliance, whose cover shows a Navy officer shaking hands with a blonde-haired, Nordic-looking female "alien" in a skin-tight silver outfit. 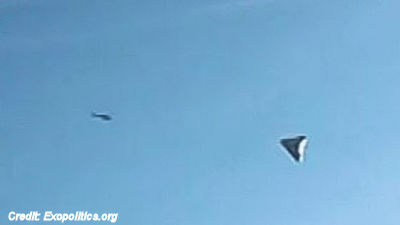 Jet Fighter Follows UFO Over Tampa!